Autoimmune diseases arise when the immune system turns on itself, triggering an inflammatory response that destroys the body’s own tissues. Rheumatoid arthritis (RA) erupts when the immune system, which normally protects against infection and disease, instead attacks the joints, causing swelling, stiffness and crippling pain. 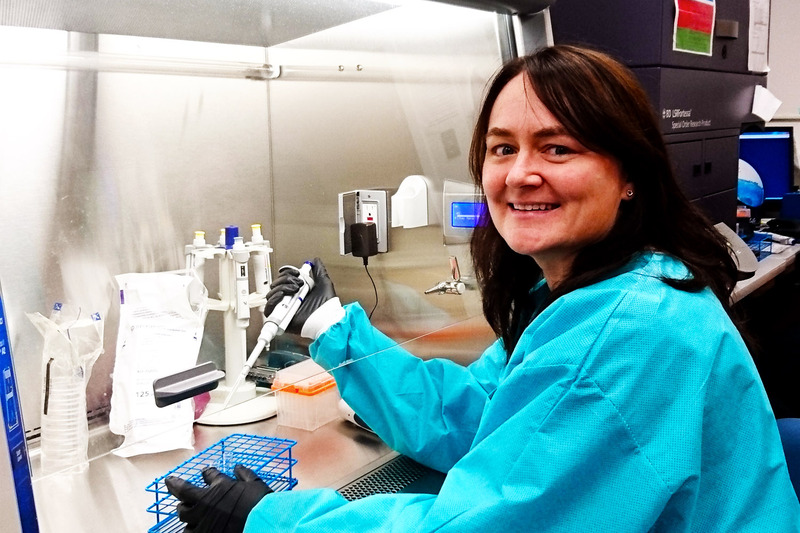 With funding from the Arthritis National Research Foundation, Hilde Schjerven, PhD, a member of the Precision Medicine in Rheumatology (PREMIER) Center, is exploring autoimmunity at the University of California, San Francisco. Her promising research is illuminating links between autoimmune diseases and a gene family called Ikaros. While drugs that suppress the autoimmune response slow the progression of the disease and help stave off joint damage, researchers are working to understand the origins of autoimmune diseases. How autoimmunity develops is not fully understood, although RA is believed to result from interplay between genes and the environment. Dr. Schjerven is investigating how even a small change in a key regulatory gene, either inherited or acquired, sparks an outsize inflammatory response. Why do autoimmune diseases like rheumatoid arthritis attack healthy joints? The answer may lie in a gene mutation that causes the body to misread a harmless substance as a threat, triggering autoimmune diseases. Specific white blood cells, known as B cells, are vital to defending the body against infection. The B cells normally protect the body by identifying and targeting invaders while simultaneously ignoring the body’s own harmless antigens. When B cells get a danger signal from a foreign antigen (such as a virus, bacteria or other threat), they become activated and produce antibodies to defend against the attack. A small genetic change, either inherited or potentially acquired, in a key regulatory gene can control how B cells trigger an autoimmune response. “We showed that B cells with a specific change in the Ikaros gene would react and elicit a response even without a danger signal,” she says. Because rheumatoid arthritis is a complex disease, mouse models are powerful tools to help understand autoimmunity. In the mouse model, B cells are critically dependent on proper Ikaros function. Mice that carry a mutation in the Ikaros gene provide a clear model to study the role of this gene in autoimmunity. Dr. Schjerven hopes to block the development of autoimmunity in people with the Ikaros mutation by restoring the need for a second co-stimulatory danger signal. Eventually, she believes personalized medicine will be able to pinpoint underlying gene defects in short segments of an individual’s DNA. Today, people who develop milder forms of autoimmunity may not even know it because fatigue and aching joints become their new normal. For those living with the agonizing pain of severe rheumatoid arthritis, relief can’t come soon enough. Across the country, the Arthritis National Research Foundation is funding scientists whose cutting-edge research will hopefully lead to a cure for these debilitating diseases. Support more research into autoimmune diseases by making a donation today!